Astrochemistry is a relatively young and interdisciplinary subject. Researchers and students alike approach it from backgrounds in different fields – astrophysics, chemistry, physics, and even mathematics – each of which has its own conventions, terminology and perspective. Most texts that have covered the subject of astrochemistry have been written from an astrophysical view. This book stands out for being written by a chemist, with a chemist’s perspective. The author notes in the preface that the book grew from an undergraduate lecture course. This is evident in its style and content. The text has a conversational manner, and does not place a heavy emphasis on numerical analysis for explanations, which makes for fairly easy reading. The layout of its chapters on astrochemistry in the first half of the book is familiar. As might be expected from the subtitle, astrobiology is a theme running throughout the text which provides a focus for its examples and discussions. The latter chapters venture into solar system and planetary chemistry, with sections on recent missions to Mars and Titan, and also prebiotic chemistry. These extra dimensions to the book also distinguish it from other astrochemistry texts. The book is illustrated with ample figures, diagrams and photographs, a small selection of which are in colour. Unfortunately, the quality of reproduction for some of the black and white figures diminishes their impact. They are, however, available electronically with various other material on a website accompanying the book. 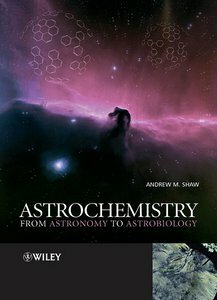 On the whole, it gives an up-to-date account of astrochemistry, although in fast moving areas of research, such as extrasolar planets, there have inevitably been significant advances since the book was published in 2006. This is a sound and comprehensive guide to astrochemistry suitable for students at the undergraduate level. Readers searching for more advanced material may require additional sources. However, this remains a very useful introduction to the field of astrochemistry. This book has some serious flaws. While the content/story is good, the book is riddle with errors and mistakes. Multiple times the author forgets how basic units (kJ and J) work, and in other places ignores the basic rules of chemistry that are taught in General Chemistry, such as stoichiometry. This is particularly shown in chapter 8 when he deals with equilibrium. I would recommend looking elsewhere for a book in this area, as you spend more time correcting errors than it is worth.